“Ballet to the Tambourine Man”, a 24” x 18” x 1.5” figurative painting on cradled board, depicts a ballerina on point playing a tambourine. It is a mixed media painting done with acrylic & oil paint, charcoal, lace & decorative paper. The painting comes wired and ready to hang, no frame needed, as it is 1.5 inches deep and painted black on the sides. Three threads are running through this painting. First of all, I was attracted to the incongruity of the ballerina with a tambourine. Tambourine is not an instrument one would associate with graceful ballerinas. I play tambourine; it is a loud, percussive instrument. When I first started playing it, I ended up with bruises on my right hip because I was hitting the tambourine on my hip on every other beat! Graceful, I was not, but it sounded good. Secondly, the title of the painting derives from the song by Bob Dylan, "Mr. Tambourine Man", a song in which Dylan invokes his artistic muse, the tambourine man, to inspire him to continue with his art. We all know that Dylan has one heck of a muse! I love that Dylan personified his muse as a tambourine man. 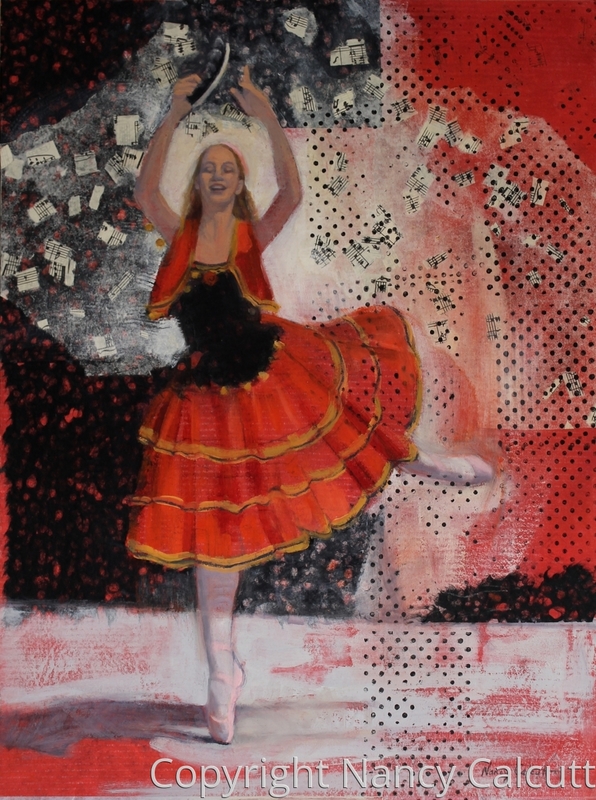 In my painting, I imagine that the ballerina is doing a dance to the tambourine man or Dylan’s muse. Thirdly, there is a red and black color combo in this piece that is powerful. Red, the color of love and black, the color of death; love & death, the two most universal themes in art. There is an artistic saying that I heard many years ago that I believe is true… that if you want a lot artistic impact, paint it large or paint it red. The color red can be a little intimidating, not for the faint of heart, but visually it is stunning. Also, the painting has actual textural elements created by the lace and confetti papers that I collaged onto the piece. The black lace paper is unusual because it has holes in it that show the red layer underneath.